Warmer weather brings with it the excitement of your getting to spend more time outdoors in the yard or on the patio with family and friends. 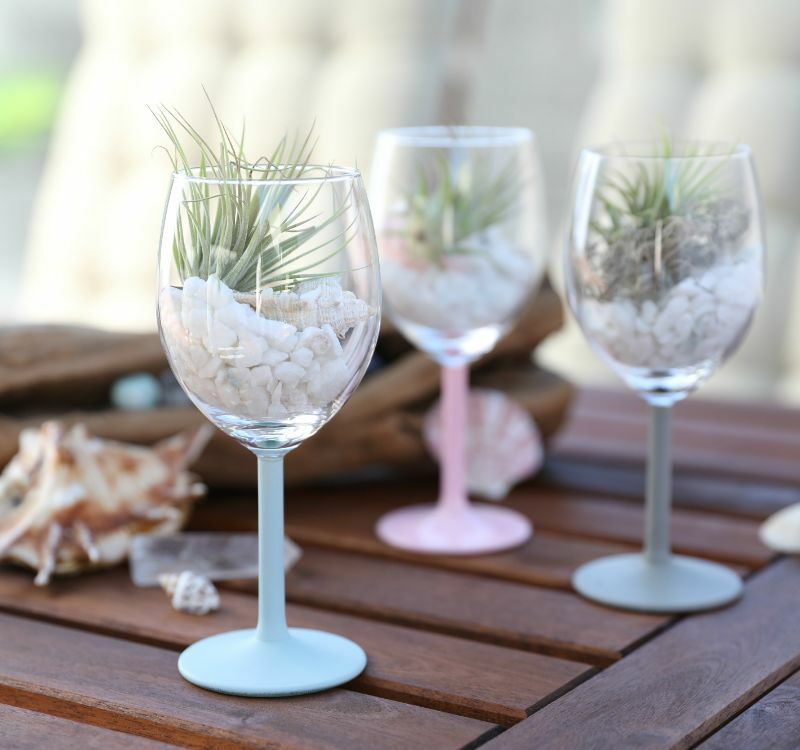 When searching for a fun way to decorate an outdoor space and incorporating elegant style, consider turning a wine glass into a creative terrarium. This DIY project doesn’t take much time at all and requires little more than some well-placed spray paint and natural accent items that highlight summertime greenery. Putting an extra wine glass to use as a terrarium will also inspire conversation when the time comes to host a neighborhood party or small get-together. A stemmed wine glass works best for this project, as it allows you to apply spray-painted color to make the final look more customized. While this terrarium could stand alone, it looks especially charming when arranged along with two or three other wine glass terrariums. Stems painted in a variety of pastels create a lovely contrast when set on an outdoor table. White stones in the bottom of the glass add a bright, warm-weather touch to the terrarium, but you could easily mix and match them with other colors. Add a beachy touch to the terrarium by placing a seashell inside the glass, alongside the faux succulent plant. 1. Place a wine glass upside down on a flat working surface with the base and stem facing up. 2. 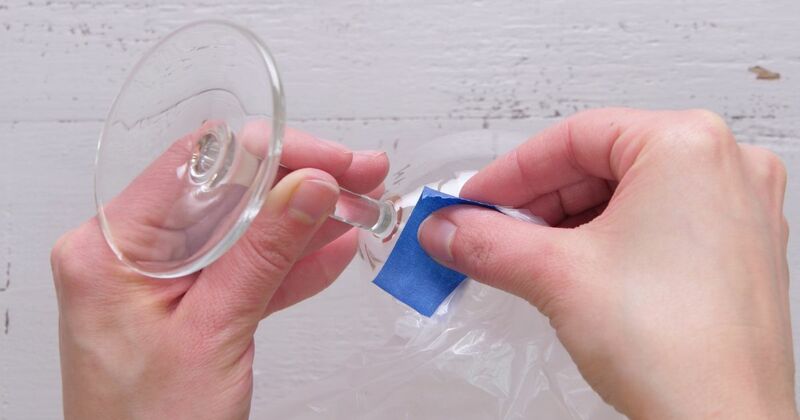 Attach the corner of a plastic sheet to the cup portion of the glass using painting tape where the cup meets the stem. Continue taping the sheet around the glass until the entire cup is covered in plastic and only the stem and base remain exposed. Tuck excess plastic into the mouth of the cup. 3. Paint the stem and base with Rust-oleum chalk spray paint in Serenity Blue. Make sure both the stem and base are covered, and there's no glass left exposed. 4. Remove the painting tape and plastic. Place the wine glass right side up on a flat surface. 5. Fill the wine glass with half a cup of white craft stones. 6. Place a small plastic succulent plant into the wine glass on top of the stones. 7. Add a seashell next to the succulent plant for a summertime look. Display the wine glass terrarium on an outdoor table to admire and enjoy. Share this unusual craft idea on Facebook.